(Nanowerk News) Researchers from the London Centre for Nanotechnology (LCN) have discovered electronic stripes, called 'charge density waves', on the surface of the graphene sheets that make up a graphitic superconductor. This is the first time these stripes have been seen on graphene, and the finding is likely to have profound implications for the exploitation of this recently discovered material, which scientists believe will play a key role in the future of nanotechnology. The discovery is reported in Nature Communications, 29th November ("Superconductivity in the intercalated graphite compounds C6Yb and C6Ca "). Graphene is a material made up of a single sheet of carbon atoms just one atom thick, and is found in the marks made by a graphite pencil. Graphene has remarkable physical properties and therefore has great technological potential, for example, in transparent electrodes for flat screen TVs, in fast energy-efficient transistors, and in ultra-strong composite materials. Scientists are now devoting huge efforts to understand and control the properties of this material. 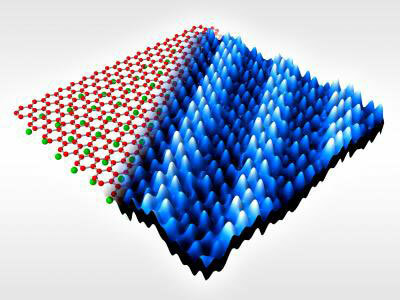 These are electronic stripes, called "charge density waves," on the surface of a graphitic superconductor. This work is part of an ongoing multi-disciplinary research effort into graphene at the LCN and follows on from the original discovery of superconductivity in the graphite superconductor CaC6 by Weller at al. published in Nature Physics. Professor Jan Zaanen of Leiden University and winner of the prestigious Spinoza prize for, among other things, his role as proponent of the stripe concept for atomically thin materials, commented: "This discovery is another important step towards demonstrating the ubiquity of stripes, and the fact that they appear in the world's simplest host – the two-dimensional network of carbon atoms that is graphene – means that more great science and applications are not far behind."